Rooted in the basic principles of a community college, our institution believes in opportunities for higher education and training for anyone. This means barriers that prevent students from attending college must be identified, analyzed and addressed. These barriers include socioeconomic status; geographic challenges; and students with unique, individual life circumstances that hinder the ability to receive a quality higher education. Four years ago, our president encouraged us to identify potential solutions for two initiatives we identified as strategic goals. First, creating a “first-day ready” concept for our students, and second, lowering the cost of educational resources to our students. These needed improvements led to the adoption of the “Instant Access” model at Hinds. This model allows us to provide eTextbooks through a common platform and direct access to publisher online resources through our learning management system (LMS). These resources are available on the first day of classes and students are charged greatly reduced fees for these materials as part of their registration process. By preloading all learning materials into our course shells through our LMS before a term begins, we ensure all students are provided equal opportunities to be successful in their coursework. They are ready to hit the ground running on the first day of class, without the worry of the administrative processes that seem to overwhelm students before they can even begin their programs of study. This model allows our teachers to focus on the goals and learning outcomes of their courses by removing barriers that may have prevented successful alignment previously. When comparing data for the courses that have adopted this model with the same data from the courses before the adoption, we found lower no-show rates, higher retention rates, and higher success rates. While it’s always understood in any research that various factors could be influencing those results, we are encouraged to see those three data points moving in the right direction. Students used to tell me all the time how disengaged they were with their textbooks. They bought them simply because their instructor required it. Students often used them for the bare minimum of what they needed to complete assignments. We believed much of this disengagement came partially from simple inconvenience of accessing the information and of carrying their textbooks around everywhere they went, like I did. 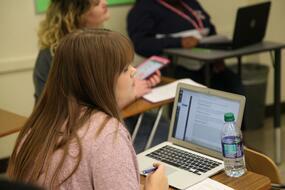 For Hinds, this model has created a reemergence of the relevancy of textbooks. Students are much more likely to carry their phones, tablets, or laptops than they are an assortment of heavy books. When they can quickly reference the material on the fly, the engagement with and usefulness of these resources begin to reemerge in our learning processes. Finding an answer through the textbook should be just as easy as finding an answer through an internet search engine. Convenience and access to our learning materials should be seamless. Hinds’ Instant Access is bringing that to our students and is helping to break down the walls of our classrooms to ensure learning can occur anywhere, anytime.